Garlic, whether fresh, or as an oil in capsules, gets rid of the evil spirits that plague the health-conscious adult. There are two places you find braids of garlic: Hanging in the kitchen of any chef worthy of the name, or formed into a wreath on the door of someone trying to ward off evil spirits or vampires. While this article is not about vampires, it does cover a number of health conditions that are sucking the life out of millions of people around the world. 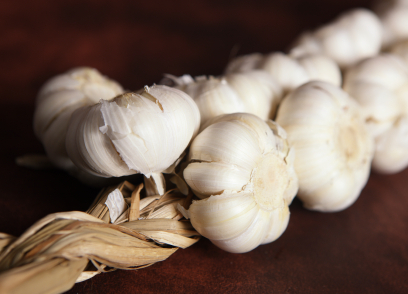 Find out how garlic can help you ward off some of the most virulent vampires of the 21st century. The new vampires aren’t found in Transylvania, and we don’t know them by names like Dracula, Blue Beard, Bathory or Rasputin — instead, we’re defending ourselves against high cholesterol, high triglycerides, high blood pressure, cancer, blood clots, and a plethora of bacteria. Fortunately, while garlic’s ability to ward off Dracula et al, may be a myth, scientific studies have proven it effective in addressing these health problems. According to an article published by the pharmacy department of Wright State University in Ohio, the benefits of garlic have been the subject of about 2500 studies. Some have proven it effective in lowering triglycerides and low density lipoproteins (LDL — the ‘bad’ cholesterol) while increasing high density lipoproteins (HDL — the ‘good’ cholesterol), others have shown it to inhibit the formation of blood clots, and still others have found it to lower blood pressure and decrease the incidence of cancer, especially in the GI tract. Health care experts also extol its virtues for stabilizing blood sugar, treating arthritis, asthma, colds and flu, insomnia, liver disease, sinusitis, and yeast infections. It may also prevent ulcers by inhibiting the growth of helicobacter pylori, the ulcer-causing bacterium. What makes garlic such a potent disease fighter? A rich combination of about 20 phytochemicals with antioxidant and antibacterial properties that help detox the body and mop up free radicals; several sulfur compounds that promote healing; and a wide range of vitamins and minerals including calcium, folate, iron, magnesium, manganese, phosphorus, potassium, selenium, zinc, and vitamins B1, B2, B3 and C.
Eating raw, crushed garlic may not be acceptable unless you live on a desert or deserted island, but fortunately, it’s also available in capsules or as an oil. You can even find it with added parsley (a natural breath freshener) to tone down the odor. However, if you do notice a lurking stranger with raven hair and a widow’s peak, pale skin as smooth as marble with a slight bluish tinge and slightly pointed teeth, forget the garlic oil, pills and capsules — head straight for the produce section of your local grocery store and get that wreath braided and onto your front door, pronto.